When Elizabeth and Liz of Simple Simon and Co first told me about their upcoming fabric collection, Four Corners for Riley Blake, I was dying to see it and play with it. So of course I jumped at the chance when they invited me to use this collection. This fabric is full of simple, graphic designs inspired by American southwest motifs which are so popular right now. You can see more projects – just visit the Four Corners blog tour going on at Simple Simon and Co to get the details. The main focus print is especially fun and versatile and comes in three different color ways. It’s a southwest-inspired striped panel – almost like a woven native-american blanket. I decided it would be fun to cut-up those strips and let them play with the other prints in the collection. I’m a sucker for row quilts – they are a great option for a simple, fast quilt construction and a good way to show off a variety of prints. I decided to focus mostly on the black, white and gray prints, with just a little bit of color thrown in. But this would be a fun project mixing all the colors in the collection for a really colorful quilt too. Four Corners fabric is available here. There are some important techniques when making a row quilt. First of all, it’s important to square up your fabric edges before you start cutting off strips. First of all match up the two selvage edges. This may mean that the cut edges no longer match up and may require re-pressing the fold. Now place your new folded edge along a straight line on your cutting mat. Line up a straight line on your long ruler along that folded edge and using a rotary cutter, carefully trim off the uneven edge. Tutorial originally written for the Riley Blake blog. 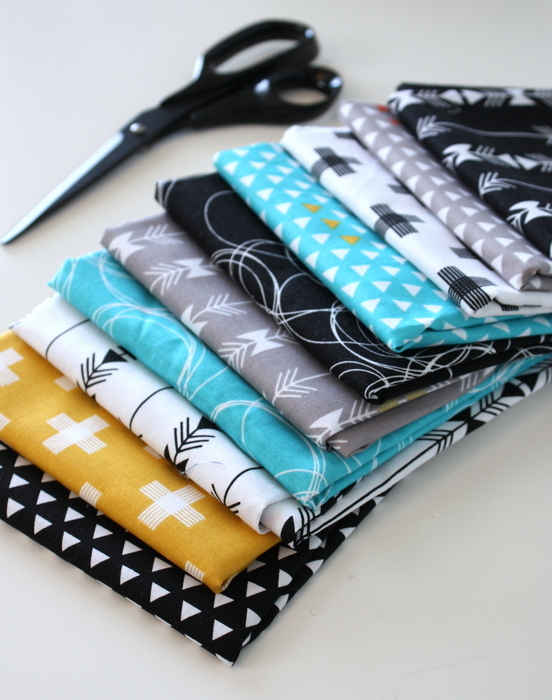 I have a tutorial on my blog with tips for cutting strips. You definitely need to square-up the fabric edges before you cut your width-of-fabric strips, otherwise you will have crooked strips or strips in a slight V shape, instead of straight across. In my opinion, one of the things that makes a strips quilt interesting is a variety of strip-widths and a variety of scale in the prints used. So if you use this tutorial with other fabrics, keep that in mind. Lay out all of the strips in order before sewing. Sew all seams using a ¼” seam allowance. Pressing each seam as you go will also help keep your quilt straight and square. Press all seams one direction. Carefully square off selvage edges and square-up quilt sides. (Tip: Line up horizontal ruler markings on top of seams to keep sides square.) Quilt top needs to measure smaller than quilt back in all directions. Here is the back of the quilt. I think I like it as much as the front! So I may just call this “the other front.” Using that main Four Corners panel print as an accent framed by yardage is a super-simple way to make a fun, on-trend baby quilt! Piece gold 34” x wof strip and 11” wof strip on both sides of 16 ½” x 42” panel. Press seams toward gold. Baste quilt top, batting, and quilt back together and quilt as desired. I used an all-over square stipple design to echo the geometric designs in the fabrics. Bind: Trim selvages and sew remaining 2 ½” x wof strips end to end to create binding. For more photos and directions on Binding a quilt there is a binding tutorial here. Click here for a printable PDF version of this pattern. And there you go! 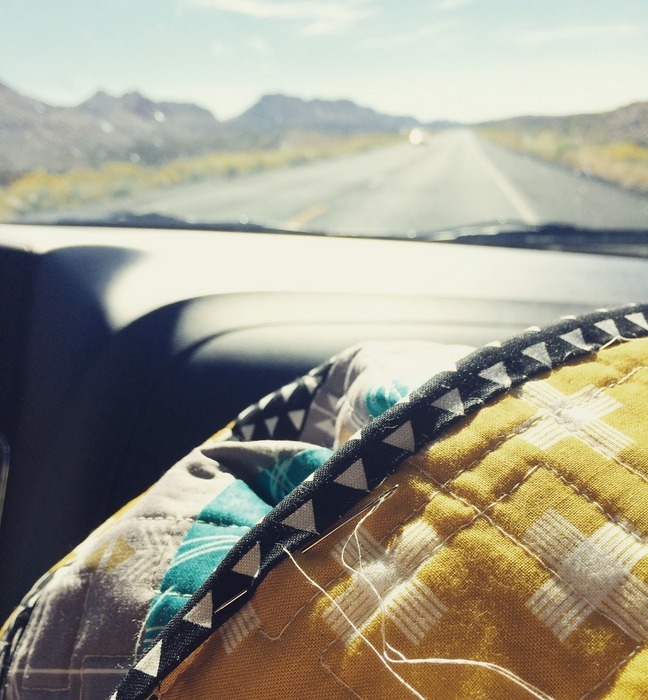 A quick quilt and very on-trend in graphic southwest-inspired fabrics. Perfect for a quick and popular baby gift! And finally, what you’re not seeing in this picture are some strategically placed rocks, holding down the quilt, making sure it doesn’t blow away into the Grand Canyon! Quilt staging is very technical business. And here’s an action shot where I made my family pull over to the side of the road in Monument Valley on our way through. Turns out barbed wire fences – if used very carefully – make even better quilt holders than husbands and children. And here’s a farewell sunset from Monument Valley – not far from the actual Four Corners in the United States. Pretty spectacular, if you ask me. Four Corners fabric is available here. What we all do for that perfect picture :)! Beautiful Quilt and beautiful quilting on it!! Wow, I love it! You do such beautiful work, always the exact right thing with each group of fabrics! Thank you so much for the tutorial, too! I am absolutely in love with this fabric!!!! I was looking for fabric for a baby boy gift. I have now found it!!!! I love it because the precious bundle won’t out grow this fabric. Colors are amazing! Can’t wait to order it or maybe win it. This fabric went very well with your travel plans. Pictures are stunning! Thanks for the tips for making this blanket. I look forward to reading your blog always. Love this quilt! And the scenery is awesome! That’s photo staging above and beyond the call of duty! It’s a beautiful quilt and your photographic efforts are beautiful and much-appreciated. Yes, I am totally impressed with your staging. Monument Valley???!!! WOW. Love the quilt (both quilt fronts) and your staging is the ultimate! BEAUTIFUL QUILT, THE STRIP PATTERN WAS A PERFECT WAY TO SHOWCASE IT. MY HUSBAND AND I ARE HOPING TO GET A MOTOR HOME AND DO A NATIONAL PARK TOUR AND I FOUND THIS AND YOUR PREVIOUS BLOGS VERY INSPIRATIONAL. IT WAS SERENDIPITY THAT I HAPPENED UPON THEM. IF I COULD ASK A QUESTION,,,,WHAT CAMERA DO YOU USE? YOUR PICTURES WERE STUNNING IN COLOR COMPOSITION AND CLARITY!! KEEP QUILTING AND EXPLORING…. We went on a long trip to England last summer and I didn’t want to haul my big camera so I bough a Sony mirrorless SLR. It’s so much smaller/lighter than the big DSLR cameras and I love it! I take it on all our travels now and it takes GREAT pictures! What a beautiful quilt and perfect setting for a photo shoot. Beautiful! I’ve never stopped loving the colors of the Southwest and fondly remember my brief time living in Sedona. Thanks for the grins on quilt staging efforts :). Love, love, love this quilt! Pretty sure I will be making one for myself! Beautiful!! Love the quilt(s). How awesome to get 2 quilts! Just deciding which to showcase would be my problem. Thank you for the tutorial. I love this! And such beautiful landscapes to compliment the beautiful quilts! Love the quilt but have to say the back is my favorite!! Great pictures too. This is a very striking quilt thanks for sharing it. I appreciate the tutorials you have posted as of late. The vacation pictures are always so nice and nature with all it’s color variations always inspires and challenges us. Love all the staging you did with the quilt. It is absolutely beautiful, you did a very good job. I love your quilt. It is my favorite colorway. Great scenery. I miss Arizona. The fabric was just released, so you should be safe! 😉 Have fun! Love the simplicity and graphic impact. I love this quilt, the fabric and how you put it together. And, you’re right, the back is just as pretty as the front! Just beautiful…I have to make one for Christmas for my daughter!! Great quilt Amy and such an amazing setting. Think I may have to try this one myself. Thanks for the tutorial on strip quilting. Your quilt is beautiful and the scenery is stunning! Makes me want to get the RV on the road headed west! What a beautiful quilt and amazing view! Beautiful fabric and quilt!! Reminds me of a cozy bulky sweater. Not sure I would have hung it on a barbed wire fence though!! Nice pics. That’s a knockout, Amy, a stunner. Love the quilt! A perfect place to photograph it. I was at Shoshone Point 2 weeks ago- spent 3 nights camping in the Canyon. Truly a remarkable national treasure. Love the pictures of that quilt at the grand canyon! WOW, does that set it all off or what? Really pretty-you highlighted this fabric well using this pattern. And now we know what you were working on in the car!! Beautiful quilt and photos! It’s amazing to be able to find and see so much of your family’s history! And now I really miss the Southwest! I traveled there a lot prior to having kids, so my husband and young children have not gone; someday I will drag them all on a road trip out there! The National Park quilt blocks looks like a fun project!! Good luck finding more information on them and please share if you do! A very smart looking quilt. Love the southwest look and colors and the photos on location are great!! Wow! So beautiful! This is definitely my next quilting project! Do you know how many yards of each you used? Well done! I don’t specifically remember what I used, but basically you’d need 10 1/2 yards or 20 1/4 yards of fabric to make a similar quilt top. Amy, I have searched high and low over at the Riley Blake site as well as your tutorial to find the cutting instructions and fabric requirements to make this quilt. I love it and want to make it for a dear friend. Can you please help me find the link? D’oh! So sorry – I thought I’d updated the link in the post, but clearly I hadn’t. yikes. That’s fixed now. Thanks so much for the heads up! I love love both sides of this quilt. I hope it is OK to copy it. I have wanted to make a “southwest” quilt for awhile but did not see a pattern I wanted or fabric I wanted and here us both. Thanks. Thanks so much for the heads up Diana! I just updated the post with the full tutorial. Enjoy! Yeah!! Thank you so much! Wow! I just love this. So beautiful. (And I love the place you took pictures of the quilt afterward!) Thank you for sharing.